I n 1951 several members of the East Aurora Country Club joined with H.R. “Renny” Merritt, Jr. to further his idea for an invitational golf tournament for junior golfers in Western New York State. Merritt, sectional committeeman for the U.S.G.A., felt that such a tournament for boys who have not reached their 18th birthdays, could contribute to the growing interest in golf on the part of many youngsters. 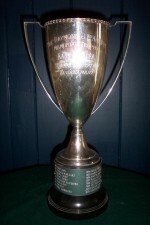 In 1953 the first annual Junior Golf Invitational tournament of the East Aurora Country Club was held, with Ward Wettlaufer winning the McAuliffe Trophy emblematic of the championship. At that time competitors were principally from Western New York but as the years passed the invitation list has been widened to include better golfers from other distant regions. Competition in more recent tournaments has come from such cities as Cleveland, Washington, Chicago, Philadelphia, New York, Toronto, Montreal, Pittsburgh, Miami and Detroit, and from such states as North Carolina, Florida, Massachusetts, Maryland, New Jersey, Michigan, Vermont, Connecticut, Delaware, Missouri, Ohio Georgia, Mississippi, Arizona, Nevada and West Virginia. Foreign competitors have come from South Africa, Mexico, France, Philippines, Scotland, Japan, Columbia and Peru. Of course, a large number of upstate New York cities and towns have been represented too. Prospective contestants have been brought to our attention by various State and Province Junior Golf Chairman, District Associations of metropolitan areas, college golf coaches, club professionals, and former players who always go away impressed by the competitive level of our tournament. The East Aurora event is now the oldest International Junior Golf Invitational in North America. A four-day test, it is the first and possibly the only PGA member club-sponsored competition of its type in the entire country. The East Aurora Country Club was particularly well-suited for such a tournament. Its adult membership has been especially generous in allowing junior members the use of their course during the golfing year. Co-operation of the entire membership of a golf club is absolutely necessary in order to conduct a golf tournament such as this. In addition to surrendering the use of the club for four days, members of the EACC open their homes to the competing boys who travel long distances to play in the tournament. The boys are responsible for transportation to and from Buffalo. If arriving by public transportation, the committee will meet the players and provide transfer to East Aurora. All contestants who request it, stay at the homes of members so that they are housed, fed and chaperoned during their stay. The contestants are served buffet luncheons each day between rounds at the Clubhouse. A banquet is held at the conclusion of the stroke play. This presents an opportunity for the boys to get to know each other and to meet the tournament committee. The exemplary conduct of the boys who have competed over the years has been one of the biggest factors contributing to the success of the tourney. It is easy to understand that if the invited guests were not chosen carefully, then poor behavior might easily result which would soon cause the members who annually open their homes to the players to turn their backs on this wonderful tournament and it would cease to be held. Families are responsible for making sure the competing boys in their charge have transportation to the Club on time each day. And they are responsible for picking up the players at the course at the end of each day’s play. The proper combination of well-behaved young men and conscientious interest on the part of many club members has resulted in an excellent well-disciplined tournament which the Club and the community welcomes back each year. Tournament week consists of a Member-Junior 18 hole team event on Monday. After registration and opening ceremonies on Monday, the field of 80 plays 18 holes of stroke play on Tuesday. Wednesday morning the second round of Stroke Play determines the following Match Play pairings. Wednesday afternoon the low 32 start the Championship bracket of Match Play. Matches are contested over 18 holes. The 16 losers of these opening matches will continue in the Championship Consolation bracket. The next 48 qualifiers will be flighted in 16 man brackets: Gold, Silver and Bronze. Thursday morning and afternoon will have 18 hole matches in all flights. These results will set up the semi-final matches Friday morning and the finals for Friday afternoon. In 1965, shortly after Gary Player’s much-to-be admired generous cash gift to the U.S.G.A. for the encouragement of junior golf in America, the East Aurora Junior Invitational Committee sought the privilege to be the first to acknowledge Mr. Player’s good will with a tribute to him in the form of the Gary Player Cup to be awarded annually in his honor to the tourney Medalist. We believe this has become one of the finest and most cherished junior golf trophies awarded anywhere in the world. In 1996 the Mexican Golf Federation extended an invitation to field a team to represent the International Junior Masters in the first International edition of the Mexican National Juvenile Tournament. In recent years the Selection Committee has tried to acquire the top caliber players from as wide a geographic area as possible. We are striving toward a world-wide showcase junior field that will create the highest level of competition. Handicaps of zero to four now represent 95% of the field. Qualifying scores for the Championship Flight have been lower each year. Beginning last year, we present an award honoring former IJM Director Jim Bell, who passed away in 2015. Some of the outstanding past players who have played in the International Junior Masters and their accomplishments. Ward Wetlaufer Buffalo, NY Played in 1953. 1953 IJM champion. Outstanding Amateur player. Member of the 1959 U.S. Walker Cup team. Porter Cup Champion in 1960 and 1965. Member of The Greater Buffalo Sports Hall Of Fame. Dr. John Konsek, III Buffalo, NY Played from 1953 – 1957. 1954, 1955 and 1957 IJM Champion – 1955, 1956 and 1957 IJM medalist. Member of Purdue University golf team and three time Big 10 Golf Champion. Konsek defeated Jack Nicklaus in 2 of 3 head-to-head matchups. Three times New York State Amateur Champion. Member of The Greater Buffalo Sports Hall Of Fame. Edward Pfister, Jr. Buffalo, NY Played from 1953 – 1956. 1956 IJM champion. Former golf professional at East Aurora Country Club, East Aurora, N.Y. for 30 years. Terry Diehl Rochester, NY Played from 1965 – 1967. 1967 IJM Medalist. PGA Tour member from 1973 through 1983. PGA Tour winner. Jim Simons Butler, PA. Played in 1966. Former Pennsylvania High School Champion and former winner in Florida of the Junior PGA Championship and the Orange Bowl Junior Tournament – Wake Forest University – Member of the 1971 U.S. Walker Cup Team – Played on the PGA Tour from 1972 – 1988 and The PGA Champions Tour. Winner of three PGA Tour events and one of the first tour players to use a metal wood. Joey Sindelar Horseheads, NY Played from 1971 – 1975. IJM Champion in 1974 at age 16. In 1971, at age 13, he was New York State Boys Champion. Turned pro in 1980, multiple PGA Tour winner. Now playing on the PGA Champions Tour. Jeff Sluman Rochester, NY Played from 1972 – 1975. 1988 PGA champion and multiple PGA Tour winner. Now playing on the PGA Champions Tour. Mike Hulbert Horseheads, NY Played in 1975. PGA tour member. Now playing on the PGA Champions Tour. Colin Dalgleish Helensburgh, Scotland Played from 1976 – 1978. 1977 IJM Champion. Winner of the 1981 Scottish Amateur. Member of the 1981 Great Britian & Ireland Walker Cup Team. Captain of the 2007 & 2009 Great Britian & Ireland Walker Cup Team. Jim Gallagher, Jr. Marion, IN. Played in 1978. 1978 IJM Medalist – His 139 total is the lowest 36 hole score in the match play qualifier. Turned Pro in 1983. Multiple PGA Tour winner. Member of 1993 U.S. Ryder Cup and 1994 U.S. Presidents Cup team. Brian Tennyson Evansville, IN. Played from 1979 – 1980. Played on the PGA Tour for 4 years. Billy Andrade Bristol, RI. Played in 1980. Turned Pro in 1987 – Multiple PGA Tour winner. Member 1987 U.S. Walker Cup Team. Fred Wadsworth Columbus, GA. Played in 1980. 1980 IJM Champion. Turned pro in 1984. PGA Tour winner. Woody Austin Tampa, FL. Played in 1981. PGA tour winner. Member of 2007 U.S. Presidents Cup team. E.J. Pfister, III Marilla, NY Played from 1978 – 1983. 1983 IJM champion – 1982 IJM medalist. Son of 1956 champion, the only father and son to both win. Winner of 1988 NCAA individual championship. Played on the PGA Tour. Named to Golf Magazine’s top 100 teachers list in 2009. Jeff Gallagher Marion, IN. Played from 1981 – 1982. Turned pro in 1988. PGA Tour member. Robert Friend Pittsburgh, PA. Played in 1981. Played on the Ben Hogan Tour in 1991 where he won the Fort Wayne Open. 1991 PGA Tour Q-School Graduate. First year on PGA Tour: 1992. Tony Mollica Columbus, OH. Played from 1982 – 1983. 1988 Porter Cup Champion. Played on the PGA Tour. Billy Mayfair Scottsdale, AZ. Played from 1983 – 1984. 1983 and 1984 IJM medalist. 1986 U.S. Public Links Champion, 1987 U.S. Amateur Champion, NCAA “Player of the Year”, Member 1987 U.S. Walker Cup Team. Turned pro in 1988 – Multiple PGA Tour winner. Pat Bates Boca Raton, FL. Played from 1985 – 1987. 1985 IJM champion, defeating Dudly Hart in the finals – 1985 and 1987 IJM medalist. University of Florida All American. PGA Tour member. Dudley Hart Miami Beach, FL. Played from 1983 – 1986. IJM Runner-Up to Pat Bates in the 1985 tournament. All American at University of Florida. Turned pro in 1991. Multiple PGA Tour winner. Jim Furyk Manheim, PA. Played in 1986. IJM Gold flight champion in 1986. Turned Pro in 1992. 2003 U.S. Open Champion. Multiple PGA Tour Winner. Member of the 1997, 1999, 2002, 2006 U.S. Ryder Cup Team and the 1998, 2000, 2003, 2005 and 2007 U.S. Presidents Cup team. Tom Scherrer Skaneateles, NY Played from 1987 – 1988. Member of the 1991 U.S. Walker Cup Team. Turned Pro in 1992. PGA Tour Member. Briny Baird Miami, FL. Played from 1988 – 1989. 1988 and 1989 IJM Champion – 1989 IJM Medalist. NCAA Division II champion in 1994 and 1995. Turned pro in 1995. PGA Tour member. Ryuji Imada Japan Played in 1991. 1995 Porter Cup Champion. Turned Pro in 1999. Joined the PGA Tour in 2005. PGA Tour Winner. Rory Sabbatini South Africa Played in 1993. 1993 IJM Champion. University of Arizona. Turned pro in 1999. Multiple PGA Tour winner. Teamed with Trevor Immelman to win the 2003 World Cup. Member of 2007 International Presidents Cup team. Tim Clark South Africa Played in 1993. 1997 U.S. Public Links Champion. Turned Pro in 1998. PGA tour member since 2001. Member of the 2003 and 2005 International Presidents Cup team. Trevor Immelmen Somerset West, South Africa Played from 1994 – 1995. 1998 U.S. Public Links Champion. Multiple European PGA Tour winner and PGA Tour winner. 2008 Masters Champion. Teamed with Rory Sabbatini to win the 2003 World Cup. Member of the 2005 and 2007 International Presidents Cup Team. Akio Sadakata Japan Played in 1994. Joined the PGA Tour in 2004. Camilo Villegas Medellin, Colombia Played in 1997. University of Florida. Turned Pro in 2004. Earned his PGA Tour card for 2006 by finishing 13th on the 2005 Nationwide tour money list. Multiple PGA Tour winner. Matthew Every Daytona Beach, FL Played from 1998 – 2001. 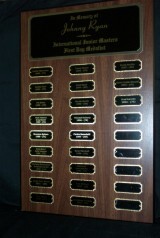 2001 IJM Champion – 1998 IJM Medalist. University of Florida. Three time 1st team All-American. 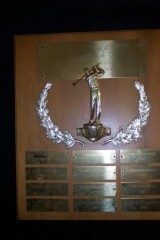 2006 Ben Hogan Award Winner. Member of 2005 Walker Cup Team. 2008 was his rookie year on the Nationwide Tour. Earned his PGA Tour card for 2010 by finishing 10th on the 2009 Nationwide tour money list after winning the Nationwide Tour Championship. The International Junior Masters owes its life to H.R. “Renny” Merritt, Jr. In 2005 we honor the legacy of our event’s founder by unveiling the Renny Merritt Trophy, signifying the tournament championship. It was Renny who first conceived the idea of an invitational golf tournament for boys of age 17 and under at East Aurora Country Club. The tournament was first played in 1953 and is now the oldest international invitational event for junior golfers in North America.We lost Renny in 2003 at the age of 87. A true gentleman, he honored the game he loved by giving much back to it. Having literally grown up on the EACC course as a youngster, Renny developed his own skill to a point where he captained the Yale golf team in the 1930′s. While there he had the privilege of traveling to play some of the great golf courses of the world. Ultimately returning to East Aurora, he captured the club championship here many times. He also served as a USGA Rules Committeeman and officiated at many USGA tournaments around the country. The McAuliffe Trophy was retired in 2004. In 1974, a special presentation was made to the parents of Bobby Steele, a former East Aurora Junior Invitation player from Fredonia who died tragically in California last year. “Some of the boys who played with Bobby thought it might be a good idea, and the response we’ve gotten from them has been just tremendous.”The Robert Steele award goes to the tournament runner-up. In 1965, shortly after Gary Player’s much-to-be admired generous cash gift to the U.S.G.A. for the encouragement of junior golf in America after he won the U.S. Open, the East Aurora Junior Invitational Committee sought the privilege to be the first to acknowledge Mr. Player’s good will with a tribute to him in the form of the Gary Player Cup to be awarded annually in his honor to the tourney Medalist. We believe this has become one of the finest and most cherished junior golf trophies awarded anywhere in the world. In 1972, Dr. and Mrs. Joseph Griffin contacted the Junior Invitaional Committee at EACC and requested a plaque be presented in memory of their son who was drowned in the recent flood near Wellsville. The committee has decided that the medalist 15 years of age or under be awarded the trophy in memory of Joseph Griffin, Jr. who has played in the East Aurora Country Club’s tournament in the past. Joseph was 21. In 1984, the family of the 1979 champion, Johnny Ryan, established an award to honor Johnny who died in a boating accident in 1982 on Canandaigua Lake. 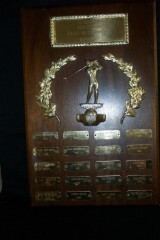 The Johnny Ryan award is presented to the first day medalist each year.